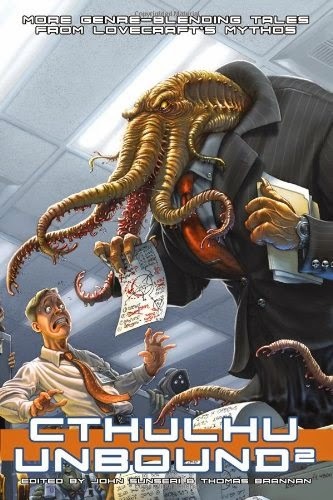 This Cthulhu Mythos anthology includes four stories with crossovers. In Douglas P. Wojtowicz's "The Hunters within the Corners," the masked vigilante Skaramine battles August Shorer, the last of Keziah Mason’s students and coven. Skaramine was mentored by an old man named Kent, who gave him his twin Colt .45s, and taught him how to heal his own wounds, change his appearance, blend into the shadows, and throw his laugh. Kent is said to have been "a shadow hunting shadows" in another era. Kent is Kent Allard, aka the Shadow. In Patrick Thomas' "Surely You Joust," Sir Dagonet, jester and Knight of the Round Table, and the mage Ganieda (Gani for short), Merlin’s twin sister, journey to the kingdom of Lyonese to recruit a knight of its court to join the knights of Camelot, but wind up nearly being sacrificed to Father Dagon. Sir Dagonet (aka the Infinite Jester) appears in Thomas’ Murphy’s Lore series and its spinoffs, which have already been incorporated into the CU, as you can see by clicking on the Murphy's Lore label. In Mark Zirbel's "Santiago Contra el Culto de Cthulhu," the masked Mexican wrestler Santiago battles Cthulhu. Talking about the villains he encounters a regular basis, Santiago says, "One week, the great-great-great-grandson of Doctor Frankenstein is trying to steal my brain to turn his monster into the World Heavyweight Champion, the next week, some voodoo priestess wants to eat my heart in order to gain control of a legion of masked wrestler zombies." Santiago’s match with Cthulhu is rather tongue-in-cheek; he immediately defeats the Great Old One by punching him in the testicles. Therefore, it seems safe to say this story takes place in an AU. In "Nemo at R'lyeh" by crossover-loving author Joshua Reynolds, Captain Nemo and the crew of the Nautilus explore the resurfaced island of R’lyeh, and narrowly avoid an encounter with the dreaded Cthulhu himself. Robur is also mentioned. Douglas P. Wojtowicz wrote a lot of Executioner novels. One of them referenced the Shadow, though unfortunately not as a real person. It was something like "Unlike, a certain radio character Mack Bolan could not cloud the minds of others." I sure you know this since Win included it in Crossovers, but John Peel wrote a Nemo/Cthulhu crossover in Tales of the Shadowmen. Of course, as long as they don't contradict each other both stories can be in the CU.